What better way to make your event special than with an ice cream cart. 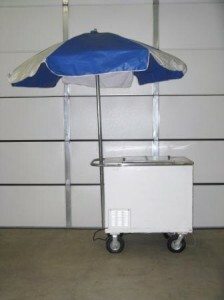 Plug the unit in over night to charge the special cartridges, unplug the unit before your event and add your ice cream. No need to worry about dry ice, and the unit does not need to be plugged in during your event. Place the cart where ever you want, open up the umbrella, and you’re ready to go. The special cartridges will keep everything cold for about 6 to 8 hours.